Most people know of Jackson Hole, Wyoming because of its beautiful, natural surroundings and wildlife. The valley boasts breathtaking views of snow-capped mountains, acres of wilderness and national parks, and its abundant wild buffalo and elk. The addition of dude ranches, rustic campsites, and ski resorts makes Jackson Hole the ideal vacation spot and an outdoors-lover’s dream. What most people don’t know is that some of the most hard-working and resilient alpine botanicals can be found in the mountains of Jackson Hole. These naturally supercharged botanicals have been conditioned for thousands of years to survive in an unforgiving and harsh environment. But they’ve somehow found a way to adapt and flourish in an area at a high altitude with low humidity, little oxygen, intense sun, and heavy snowfall! Never before did someone think to bottle up all of this potent plant goodness until now. Kendra Butler, a former Manhattanite and 15-year beauty industry veteran, is the founder and creator behind Alpyn Beauty. 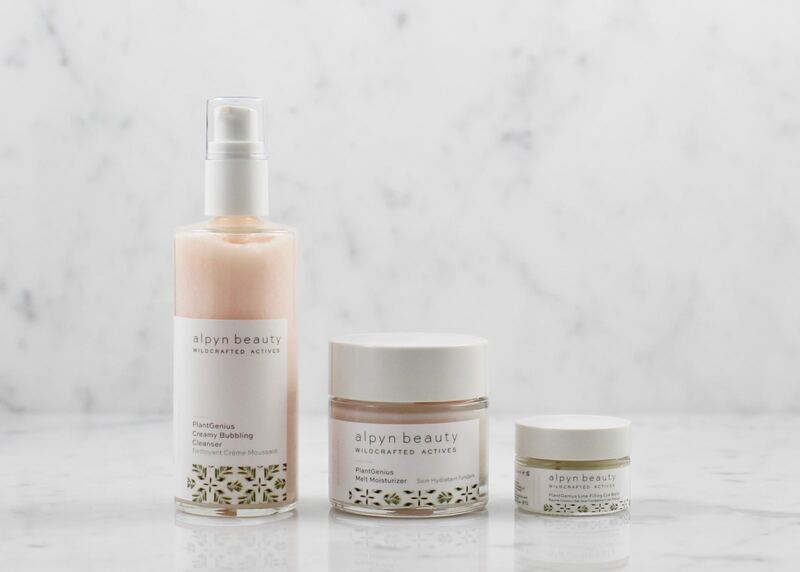 Alpyn Beauty is a sustainably-sourced natural skincare line that harnesses the wildcrafted and hand-cultivated alpine botanicals grown in the mountains of Jackson Hole. The entire line is formulated with their proprietary ingredient complex, PlantGenius, that is packed with these powerful plants and botanicals. Alpyn Beauty drew their inspiration from the region’s renowned “alpenglow,” which is the ethereal pink light that is cast at sunrise and sunset in Jackson Hole. This magical pink light illuminates the mountaintops, meadows, valleys, and forests where these ingredients grow and also lends itself to the pink hue of Alpyn Beauty’s products. Alpyn Beauty currently has three products in their collection: their PlantGenius Creamy Bubbling Cleanser, PlantGenius Melt Moisturizer, PlantGenius Line-Filling Eye Cream; and will be launching their fourth product (the PlantGenius Survival Serum) in January 2019. I’ve been testing out these products for the past few weeks, and let me tell you, it didn’t take me long to fall hard for this brand. Their formulas are so luxurious and effective and their products are such a delight to use! The Creamy Bubbling Cleanser has a pretty pink, pearlescent hue and smells of bright and energizing citrus. It is creamy (almost mousse-like), lightweight, and foams and bubbles nicely. It takes off the day’s dirt and grime exceptionally well, but I would recommend doing a double cleanse (and use this as a second cleanse) if you have stubborn makeup that’s hard to get off. It rinses off easily without stripping the skin and leaves my skin feeling soft, smooth, and silky. It cleanses, exfoliates, and softens. What more could you want? This may be my new favorite facial cleanser, yet! So good, right? I use this both day and night and find it insanely hydrating. It melts instantly on contact with freshly cleansed skin, but I find that if I use this after a mist, serum or oil, it does tend to pill a bit. When that happens, I continue to massage it into my skin until it’s fully absorbed (it takes like five seconds or so) and I’m left with silky, velvety skin — I love that it’s not greasy at all! I love using this the most after I apply a face oil — my skin feels so pillowy-soft, and firm. I honestly can’t stop feeling my face after I use the Moisturizer! With continuous use my skin does appear smoother and some of my fine lines have diminished. I also find that the Moisturizer works exceptionally well as a primer for makeup. As I mentioned above, the Melt Moisturizer is super-hydrating and should be sufficient for even dry skin types. I know I’ll be reaching for this Moisturizer a lot during the colder months! As the last step in my AM and PM routine, I dab a small amount of the Eye Balm all around my eye with my index finger. Again, like the Melt Moisturizer, it does pill a bit, but I keep dabbing gently until it’s fully absorbed. (I did try applying the Eye Balm to freshly cleansed skin and found that it absorbed pretty quickly.) I love how moisturizing it is and how smooth my eye area is after I use this. I also see a difference in terms of puffiness and brightness in my under-eye area, but unfortunately, I can’t talk to what it does for fine lines. I’m lucky to not have fine lines around my eyes (don’t worry, I have a slew of other skin issues, lol), but I imagine that it could help with that, too. Alpyn Beauty does call their Eye Balm “magic” after all! I have been really loving this brand! I feel like Alpyn Beauty offers something unique and different from other brands that I’ve tried, and it’s not often that you will find an entire line that is non-oil based. I’m excited to see what other products they come out with in the future and I can’t wait till their PlantGenius Survival Serum comes out in January! The PlantGenius Creamy Bubbling Cleanser, PlantGenius Melt Moisturizer, and PlantGenius Line-Filling Eye Balm retails for (in US Dollars) $36, $60, and $62, respectively, and can be purchased directly from Alpyn Beauty. The Alpyn Beauty products were kindly provided for consideration, however all opinions expressed are my own. This post contains no affiliate links or codes.